Pool service Poway and the wide diversity of swimming pools and spas. This is because Poway has many newer neighborhoods and yet some much older ones. With the diversity, brings newer more modern designs and some much older pools that require a little more TLC when providing weekly pool service. Older swimming pools may have not been as well designed to allow proper water flow and some of the designs were built very deep, meaning they have a large amount of water to balance. As with the newer more modern pools and spas, you will have more elaborate features such as artificial or natural rock waterfalls and water features. A large amount of the newer pools we service also have added components such as complete pool automation, saltwater chlorine systems, and much more. 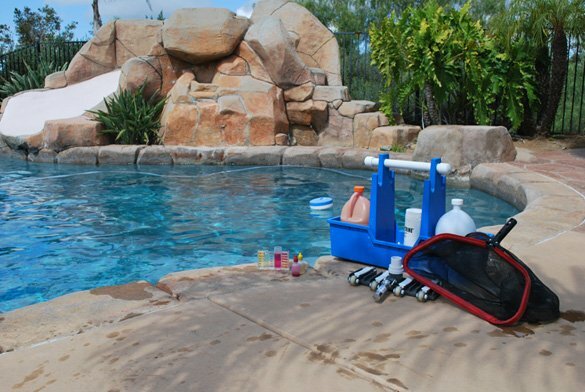 With all of the variations of swimming pools we maintain, you need to know water chemistry. You also need to know how to use and understand the new types of pool automation and how to make them as efficient as possible. Protouch is a company that pays attention to all of the details large and small to ensure the overall safety of your Poway swimming pool. This allows us to protect your family and friends along with protecting your large financial investment. 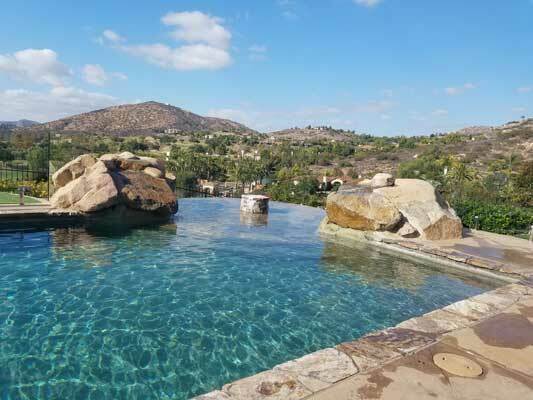 our Poway pool service has been performed for the last 20 years as this was one of the first areas we provided weekly pool cleaning to customers. Granted both business partners ran different companies back then but, we have been providing quality cleaning and pool equipment repairs for a long time. So if you are in need of a great company, we can help! 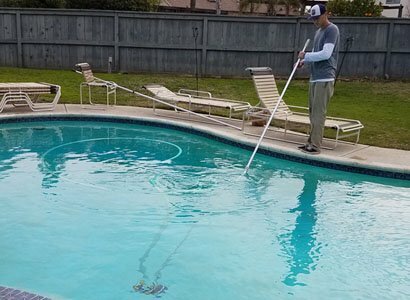 With every weekly Poway pool service visit, there are specific procedures that we follow to ensure the pool and spa are cleaned the to the same expectation each and every week. 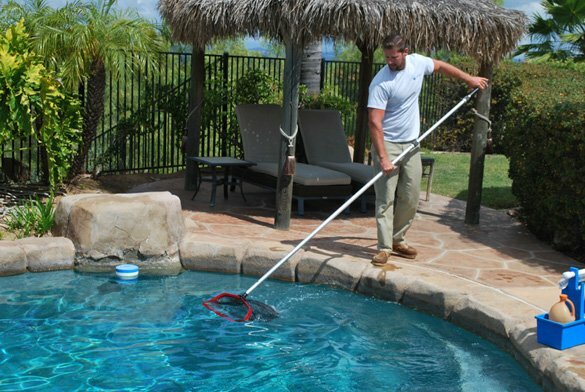 Below will describe a list of those specific Poway pool service steps taken that makes our company top notch. We perform one off pool filter cleaning and we also perform recommended scheduled pool filter cleans for our weekly Poway pool service customers. Pool algae cleaning is a specialized service that when done correctly resolves the problem quickly with as little costs as possible. Most companies don’t know the best procedure to remove pool algae and that can cost you more money and down time in the long run. Pool drain and restarts are not always needed unless your waters chemistry has been neglected. 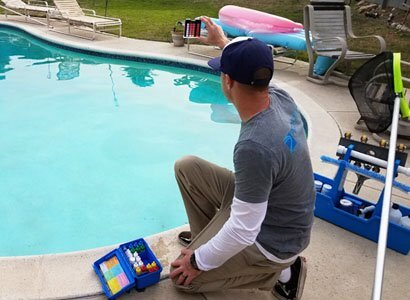 When we test pool water to determine if you need a pool drain and restart, we test your phosphates and conditioner levels (CYA). If one of these factors are to high, it may be better to drain your pool. If these levels are ok, we can usually resolve your water chemistry issues with proper chemical balancing. Pool inspections are highly recommended for anyone buying a new home. When buying a home with a swimming pool, you want to know exactly what you are getting into with the existing pool or pool and spa. 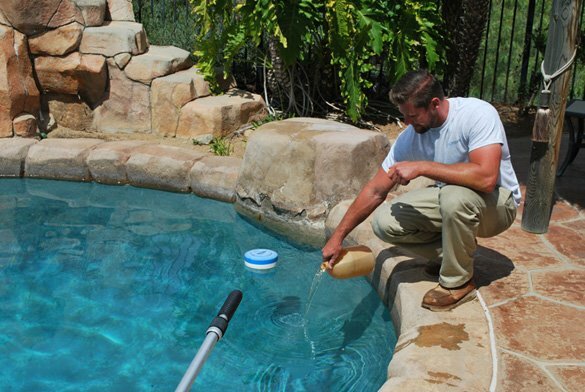 We provide detailed information with our pool inspections for all Of San Diego County. Hot tubs are very temperamental and should be maintained by a professional company. We provide quality hot tub cleaning to keep your hot tub safe and looking great. We make sure the water is always safe to protect your investment and your family and friends. A hot tub drain and clean is an important service that needs to be performed every 3-4 months. When your ho tub water starts to stay cloudy and not smell fresh, it is necessary to perform a drain and clean. Your hot tub may also need to be drained and cleaned when it has sat turned off or neglected for any amount of time. With all swimming pools, you will have a pool filter cleaning the water of all particulate. When your pool filter is dirty, it will cause your pool water to get cloudy and will cause the need to add extra costly chemicals to maintain. Depending on the type of pool filter, the size of the pool, and the surrounding landscape will determine how often you need to perform a pool filter clean. On average a pool filter clean needs to be performed every 4-6 months and occasionally more often when there is a large amount of debris entering the swimming pool. When you are encountering a pool algae problem that will not seem to go away, there are a few things you need to look at. Is your pool filter clean and in good operating condition? Then you will need to look at your pool water chemistry. If you test your water and have high levels of phosphates, that will contribute to the algae problem. Phosphates are a food source for algae and when the levels are above 120 ppb, the algae has a very active food source. This will make it very difficult to get rid of the pool algae if not impossible. The last thing you want to check is your conditioner or Cyanuric acid levels. When above 50 ppm, your chlorine’s ability to effectively sanitize the water is greatly diminished. Always try to keep your phosphate levels at or below 50 ppm. If it is much higher, the only effective way to reduce the conditioner level is to drain a portion or the entire swimming pool and start from scratch. Remember that most dry forms of chlorine such as tablets and granular chlorine have conditioner in them and that will cause your levels to rise. This Poway pool service customer called us out one day to look at her swimming pool. She was not happy with the look of the water as the swimming pool had a decent pool algae issue along with an off green color to the water and surface. Granted the pool is older, though we could tell something was off so we started checking the chemicals. The first thing we noticed was the chlorine and pH were very high but, that was only the start. We then started checking the alkalinity and that was way high which kind of leans toward the pool service guy adds liquid chlorine. The problem with that is he is not countering the higher pH levels of the liquid chlorine by adding an appropriate amount of muriatic acid. Last and worst was that the conditioner or Cyan Uric Acid levels were off the chart high. This is usually from the introduction of dry forms of chlorine especially chlorine tablets. High levels of conditioner do two very detrimental things to a swimming pool. One: The high levels of conditioner bind up chlorine disallowing the ability for the chlorine to sanitize properly if at all. Two: The high levels of conditioner over time may cause the premature failure of your pool surface. It will attack weaker aggregates in the pool surface causing circular formations or indentions along with peeling over long term exposure. Once we took over the weekly pool cleaning here in Poway, Ca, we started balancing the bad water chemistry ranges to bring them back to safe, usable ranges. We did inform the customer that no matter what until the pool water is drained and restarted, we will not be able to fully control the chemistry of the water. Knowing they were going to perform a complete pool remodel in the spring, we were OK with dealing with this short term issue. We then realized that the pool filter was a big part of the problem as it was not turning over enough water causing the pool to not clear up properly. Once we cleaned the pool filter and yes, we did need to replace all of the internal elements as the last pool guy had no clue about cleaning the filter we started seeing results. All of the sudden, the customer called us explaining that the pool has not looked so crystal clear and blue and how happy they were to see the older pool looking great again. We treat this Poway pool service customer the same as all of our pool service customers. We do what is right for the safety of the people swimming and to protect the investment of our valued customers. 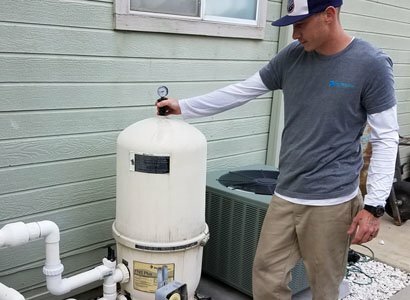 Is your pool guy doing his job correctly? Want a second opinion on the range of service you get? Or just looking for a good quality Poway pool service company, then we can help. This is a portfolio for a pool service and maintenance customer in the Old Coach Collection neighborhood of Poway, CA, 92064. The San Diego home has a swimming pool with an attached hot tub. Both the pool and spa have a grey plaster surface with custom artificial stone coping. Additionally the pool has a custom built artificial stone water slide with an epoxy coating. The separate slide water feature pump is set to run weekly to make sure fresh water is circulated through the system. 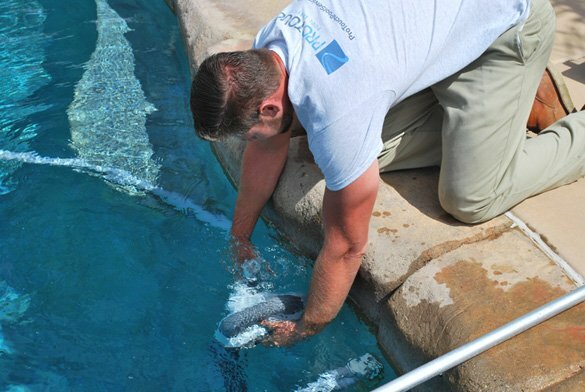 Although the pool and spa do not have tile, we still brush and clean the stone coping which extends into the pool water every pool service stop. Regardless of the type of surface, tile or coping, we keep every pool and hot tub clean and balanced on a weekly basis. 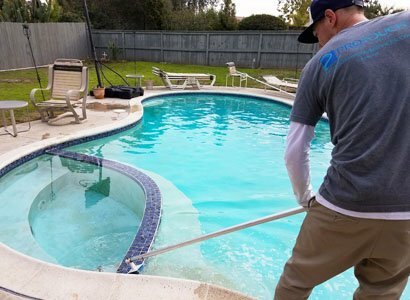 Our weekly pool service cleaning at this Poway pool and spa consists of not only cleaning the coping but also vacuuming, netting and balancing the water chemistry. Every pool service visit we empty the skimmer basket and empty the basket in each pump. To maintain a clear, inviting pool and spa we keep an eye on the filter pressure and clean the filter when it is needed. Other additional services we offer San Diego County pool owners includes pool equipment repairs and new pool equipment installations. We are also happy to offer pool automation upgrades and salt system repairs and installations. 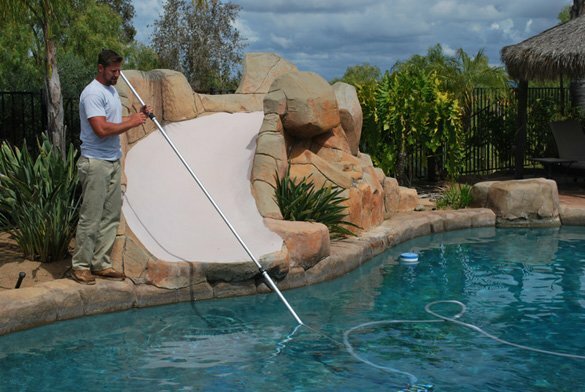 ProTouch is San Diego’s one stop pool and spa service and repair company.